Acrylate is a tiny chemical — nine little atoms. But you can find it almost everywhere. The obscure substance is a fundamental building block in modern production and consumption, and its derivatives are in everything from diapers to contact lenses, from paint to food packaging. “Acrylates are in a ton of products that we use in everyday life,” said Amanda Cook, an assistant professor in the Department of Chemistry and Biochemistry and the Materials Science Institute. She is also the newest faculty member to join one of the UO’s Cluster of Excellence programs. In her research, Cook is working to refine the production of chemicals like acrylate that are used in tens of thousands of products, to make them more sustainable. She came to the UO in July of 2018 from the Swiss technology institute ETH Zurich to join the Energy and Sustainable Materials Initiative, an interdisciplinary Cluster of Excellence that builds on the UO's existing strengths in green chemistry, sustainable materials and renewable energy. 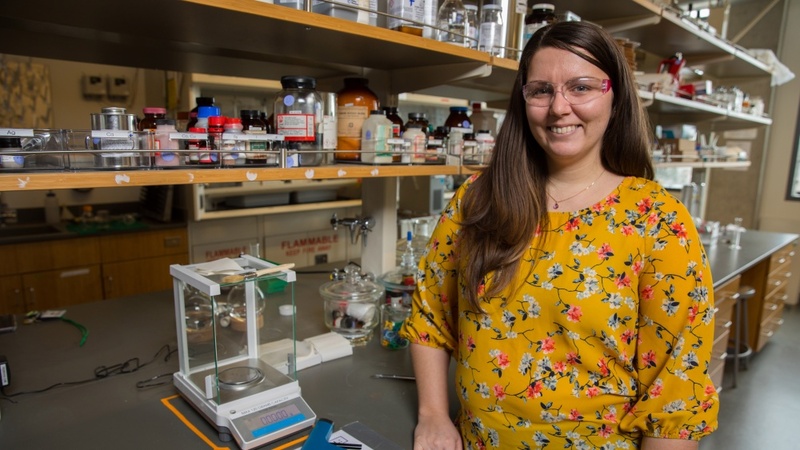 “Amanda brings a unique and important skill set to the energy and sustainable materials cluster and our chemistry department more broadly,” said Shannon Boettcher, UO professor of chemistry and co-director of the Energy and Sustainable Materials Initiative. The group is one of five small groups of scholars in the Clusters of Excellence program, which is bringing top-flight researchers in select fields to the UO to address some of society’s most significant challenges. The Energy and Sustainable Materials Initiative will grow the UO’s basic and applied sciences by bringing researchers together from different fields to work collaboratively on solving technical and scientific challenges that are critical to society. Cook herself has a varied background, with expertise in inorganic and organic chemistry as well materials sciences. Despite arriving in Oregon only in the summer 2018, her lab is already staffed by two permanent doctoral students and two rotation students. Alongside efforts to increase efficiency in the acrylate manufacturing, Cook is also researching production of catalysts — compounds that accelerate chemical reactions. Those processes involve the alteration of heavy metals like iron, nickel, cobalt and palladium. “It’s a way of taking these metals and making them into a shape or a piece, something very specific and precise,” Cook said. The process of catalysis allows metals to be made into delicate shapes or pieces, like small components of electrical equipment or machines, Cook said. Cook’s lab is refining production of materials that are in higher demand in the chemical industry in an effort to zero in on areas where sustainable production will have a greater effect. The end goal is to find innovative ways science and sustainability can intersect, helping to create a future where basic needs are met but where production is leaner and more sustainable.